When this book was first published in 1999, many were swept off their feet by the amount of information contained therein. However, the two erudite professors of medicine were not satisfied with the work. This necessitated the need to go back to the drawing board to update and overhaul this vademecum of clinical medicine. 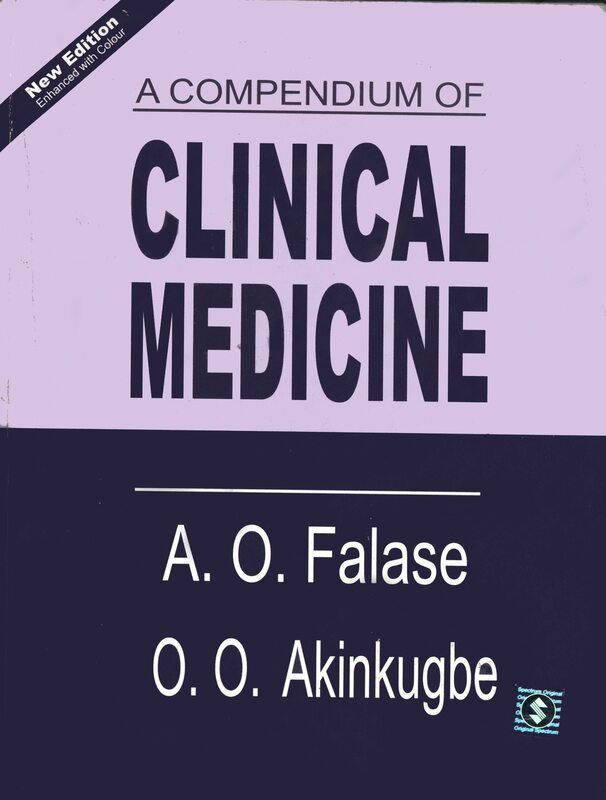 The third edition of A Compendium of Clinical Medicine is not only an ordinary revised edition; an unfortunate reoccurrence in the Nigerian book industry where authors change a few words to justify having reviewed their work. The compendium stands out heads and shoulders above any other work published in Nigeria on medicine in the tropics. The reasons are not far fetched. The authors: Falase (MD, FRCP, FMCP, FWACP, FAS, NNOM) and Akinkugbe (CFR, MD, D. Phil, FRCP, NNOM, Hon DSc) are not only authorities but have evolved into institutions in the study and practice of Clinical Medicine not only within the continent but without. Their emphasis in the book was to present an up-to-date assessment of local diseases and their relevance. This deserves a worthy commendation as most textbooks in this area are written by foreigners, and therefore are focused on infections prominent in their environment. It is therefore absurd to continue training medical practitioners in the tropics with books written for temperate climes! The compendium is an 808-page textbook in full colour, which has been extensively revised and enriched with more tables, line diagrams, figures and photographs. Bearing in mind the volume of information contained and to avoid making the book so bulky, the compendium has been formatted in double column, with a slightly bigger book size, to make reading easier and more inviting. However not everything in the past edition was discarded. In the words of the authors, this edition “retains its practical, relevant and cram-book approach, emphasising once again the importance of a good grasp of aeitopathogenesis in the effective management of diseases”. Flipping through the book one cannot but agree with the duo of Falase and Akinkugbe that the compendium’s, “… generous display of colours livens up the entire volume, making it stand out easily on any bookshelf and more importantly, readily user-friendly in the quest for sound clinical information.” The book has thirteen chapters in the following order: Clinical Examination, Cardiovascular System, Respiratory System, Gastrointestinal Tract (including the liver and pancreas), Kidney and Urinary Tract, Endocrine System, Haematology, Diseases of the Locomotor System and the Conductive Tissues, Diseases of the Skin, Diseases of the Nervous System, Infections and Infestations, Miscellaneous Disease Conditions and an Introduction to Molecular Biology. It also has a very good index for easy reference. This compendium provides an ideal ready reference for undergraduates, junior hospital doctors, general practitioners and physicians in the developing world. It will also come in handy for other health care professionals like, medical laboratory scientists, nurses, pharmacists, medical radiographers and physiotherapists who want to broaden their appreciation of clinical medicine in line with their various professions. The book will be found useful by students preparing for undergraduate and postgraduate examinations in medicine and is strongly recommended as a standard text for all medical schools in the continent.